Fat Bombs: the new craze that’s crossin’ the nation. But are these tasty tidbits a trend or are they actually what we should be eating? For the past few decades, big food corporations drilled into us that fats were the devil. Of course, there are good fats and bad fats, but this trend portrayed all fats in a bad light. This was a sneaky plan to keep a deadlier food under the radar: sugar. These companies would throw sugar into everything–sauces, spreads, and snacks–because it was cheap, readily available, and frankly, it would keep people coming back for more. Sugar addictions became a real thing and the food companies started raking in the cash, all while fats got a bad rep.
Fats still have a bad name today, but they’re slowly regaining the love they deserve. We’ve finally shattered the perception that not all fats are bad for you and most are good for you! While there are some bad fats (almost entirely trans fats in processed foods), most are well and necessary. Good fats include monounsaturated fats (found in olive oil or avocados for example), or polyunsaturated fats (omega 3’s and 6’s found in fish, nuts, and seeds). They keep your brain functioning properly, your energy stable, and your heart healthy (good fats lower cholesterol—contrary to what was previously thought). Healthy fats also keep you feeling full for longer, which cuts out energy crashes and reduces sugar cravings. Basically, fats are the way to go! To cut back on sugars and work more healthy fats into your diet, try replacing your mid-day fruit bar with a Fat Bomb. The great thing about Fat Bombs is that there are tons of different ways to make them. You can throw in some nuts, seeds, powders–anything–and they’ll usually work out. They’re also quick and easy, so you can make a bunch and store them in your freezer for a post-workout snack or midday pick-me-up. This first recipe filled with almonds, nut butter, and shredded coconut is dense, crunchy and filling. You’ll love them! To make them, follow the steps below. 1) Add nuts into food processor and blend until finely chopped. Add remaining ingredients until a thick paste has formed. 2) Roll into 1-2 inch wide balls and place on a cookie sheet. This should make around 16-20. 3) Keep refrigerated or frozen until ready to eat. This is key because the coconut oil will melt if not! 4) When you’d like to eat this little bundle of joy, remove from fridge or freezer, let sit for 5 minutes, then enjoy. This recipe is a staple. We love ‘em because they’re simple, so you can add other fixings to dress them up (see our options below. Either add cacao for a chocolatey one, a homemade pumpkin spice blend for a fall version, or get creative and come up with your own!). To make these little guys, just follow the instructions below. 1) Blend everything in a food processor until a wet dough has formed. 2) Roll into balls and lay on a cookie sheet or air-tight container and freeze. There are other ways to incorporate healthy fats into your diet, too–such as avocados or fresh salmon in salads. 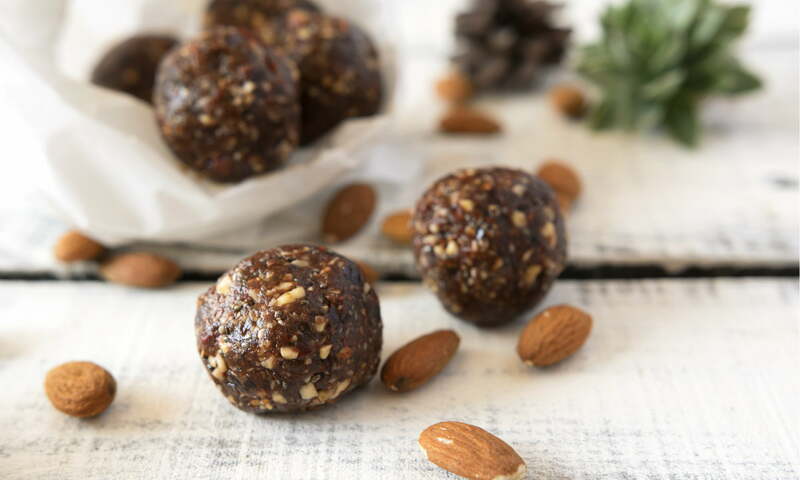 However, since most snacks are quite sweet, these Fat Bombs are a great snack alternative (goodbye sugary granola bars!). We currently have these two recipes to tide you over, but what Fat Bomb recipes can you come up with? We’d love to hear your ideas!